Google's chief executive and former member of Apple's board Eric Schmidt is stepping down to a new position as executive chairman as cofounder Larry Page takes over as the search giant's CEO. Page's cofounder Sergey Brin will also take a more active role in strategic projects including product development. The company announced the management shakeups in its quarterly earnings report. They will become effective on April 4, 2011. As executive chairman, Schmidt will handle "deals, partnerships, customers and broader business relationships, government outreach and technology thought leadership." In a blog posting, Schmidt wrote, "as Google has grown, managing the business has become more complicated," noting that Google recognized a need to "speed up decision making." Schmidt explained that, "for the last 10 years, we have all been equally involved in making decisions. This triumvirate approach has real benefits in terms of shared wisdom, and we will continue to discuss the big decisions among the three of us. But we have also agreed to clarify our individual roles so theres clear responsibility and accountability at the top of the company." Schmidt joined Apple's board in August of 2006, just as the company was completing the design of the iPhone. "Apple is one of the companies in the world that I most admire," he said at the time. "I'm really looking forward to working with Steve and Apples board to help with all of the amazing things Apple is doing." Google's own internal smartphone software project, which had been developing since its 2005 acquisition of the Android startup launched by former Danger executives, quickly shifted from an effort to clone the functionality and design of existing BlackBerry, Palm Treo and Windows Mobile devices (as was clear from prototypes floated in 2006 and 2007) into being a copy of Apple's distinct iPhone design and user interface (as began in 2008 with the HTC T-Mobile G1, as depicted in the timeline below). By mid 2008, it was revealed that Schmidt was being "occasionally excused" from board meetings when the subject began to focus on the strategic direction of Apple's iPhone. In August of 2009, Apple's chief executive Steve Jobs announced that Schmidt would step down from Apple's board, saying, "Eric has been an excellent Board member for Apple, investing his valuable time, talent, passion and wisdom to help make Apple successful. "Unfortunately," Jobs added, "as Google enters more of Apple's core businesses, with Android and now Chrome OS, Eric's effectiveness as an Apple Board member will be significantly diminished, since he will have to recuse himself from even larger portions of our meetings due to potential conflicts of interest. Therefore, we have mutually decided that now is the right time for Eric to resign his position on Apple's Board." A New York Times report from March 2010 described Jobs as feeling "betrayed" by Google's intent to clone the iPhone, and that Google had "violated the alliance" the two shared in developing services that worked on the iPad, including Google's search, Maps, YouTube and other features Apple had incorporated into its custom client iOS apps on the device. The report stated that Google founders Brin and Page considered Jobs a mentor, and were regular visitors to the company's Cupertino campus. While the relationship between Jobs and Google CEO Eric Schmidt was said to be pleasant, the two were reportedly "never close friends." At the same time, Jobs and Schmidt were also observed getting coffee together, suggesting that the split between Apple and Google was more of a business matter than a personal issue. "We did not enter the search business. They entered the phone business," Jobs reportedly told employees at a company meeting from February of last year. 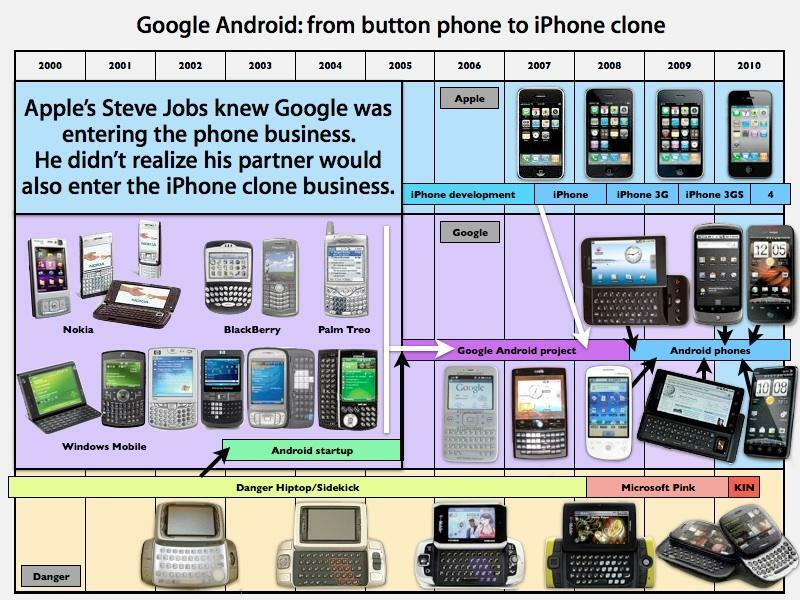 "Make no mistake; Google wants to kill the iPhone. We won't let them." Jobs outlined a variety of software and hardware initiatives to prevent Google from killing the iPhone, which culminated in the release of iPhone 4. Since its release, Verizon has reportedly experienced a drop in Android growth, and has since partnered with Apple to sell a CDMA version of iPhone 4, a move that was widely thought to be impossible just a year prior, when Verizon was advertising its Droid lineup as "manly" and depicted the iPhone as effeminate and flawed in its adverting.